Kim Hollis: Warner Bros. and DC have made no secret that they are trying to launch their own answer to the Marvel Universe. They're obviously not going to be dissuaded from this plan, but how excited do you think moviegoers are based on this weekend's results? Jason Barney: The negative reviews were out pretty early. There was a lot of buzz about this film, but one wonders if DC really missed the mark here...that if this opening was "expected" and if the movie was actually just average to good, they could have added $20-30 million to the opening. A Jurassic World type scenario. People didn't avoid it, obviously, but in my mind the result could have been higher. After this weekend the drops are going to be substantial. The current direction isn't making as much money as it could. All in all, though, just because one of the staple aspects of their push is a terrible product, that doesn't mean the rest of the DC material will be lacking. People are talking about this because it is such a disappointment, and it will sting. I don't think it means the end of the effort to rival Marvel. 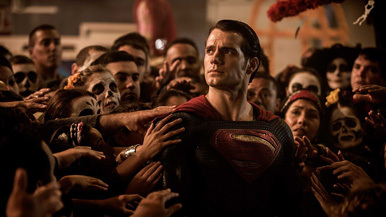 Felix Quinonez: I think this weekend's result shows that people want to like DC movies. Superman and Batman are a couple of the most iconic characters in all of fiction. And audiences were more than willing to give the movie the benefit of the doubt even if the trailers didn't look great and the movie got savaged by critics. But this seems like another strike against the DC Extended Universe. The fact is that if DC keeps missing the mark like this eventually fans won't be so willing to give them the benefit of the doubt.